In this installment of Journalists@Work, we’ll introduce you to Ta Thi Ngoan, an editor with Quang Ninh Radio & Television (QTV) in Vietnam. She has worked for this station in the country’s northern Quang Ninh province for almost four years. QTV was DW Akademie’s partner in a three-year project called “Radio for the People” and during these three years, Ta Thi Ngoan took part in a number of our workshops. 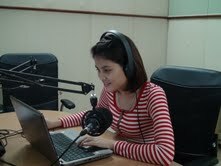 Ta Thi Ngoan is now in charge of presenting a live radio program called “60 Minutes You and I”. It’s a call-in program for young listeners and runs every Sunday. She also produces some stories related to tourism, which is a key industry in Quang Ninh province, since it is home to Vietnam’s famous Ha Long Bay. Radio listeners in Northern Vietnam’s Quang Ninh Province probably didn’t know what hit them earlier this year. Instead of drab propaganda programs, the radio was playing popular music interspersed with traffic information and listeners’ calls. And this new show was presented by a friendly host who was talking to the listeners at eye level. So far, radio hosts had sounded more like talking machines who thought it necessary to instruct the audience what to think. The program the listeners of QTV radio in Quang Ninh Province were hearing was “Rush Hour”, a one-hour morning show that the station had just started with the help of DW-AKADEMIE, Friedrich-Ebert Foundation and Vietnam’s Academy of Journalism and Communication. What does it take to produce a successful radio program? And how can you motivate the people in northern Vietnam's Quang Ninh Province to tune in? That's what the radio staff of Quang Ninh Radio & TV and DW-AKADEMIE are exploring at the moment in cooperation with Friedrich Ebert Stiftung and Vietnam's Academy of Journalism and Communication. This week, DW trainers and QTV radio journalists drew up plans for a new morning radio show. It will be called "QTV Rush Hour" and will run between 6:30 and 7:30 every morning. The show will include music, information and audience participation elements. 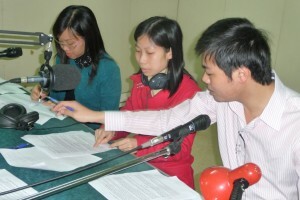 On Thursday, March 31st, the Vietnamese journalists recorded a pilot for the new morning show. If all goes well, the show will start airing live next month. Officials are clamping down on illegal campaiging during India's 5 1/2-week election. A Bollywood movie was pulled, a TV channel censored, and now a web series on the Indian leader's life has also been banned. Earlier this week, gunmen ambushed a passenger bus in Pakistan's restive Baluchistan province, killing 14 people. It's not the first time Pakistan has blamed Iran-based militants for launching attacks on its soil. A Leica promotional video alluded to the 1989 Tiananmen Square protests, prompting an angry response from China just weeks ahead of the 30th anniversary. Leica has denied commissioning or sanctioning the video. A Japanese baby boy whose birth weight was that of an apple is set to go home some 29 weeks after coming to the world. He is thought to have been the smallest baby boy ever born who survived.